With powerful, detailed sounds and great value for money, the CR3s might surprise you. Big sounds from small speakers. Affordable pricing. There are some things in this world that belie their diminutive stature: the Apple Watch, Creme Eggs, Dark Matter... although the jury's still out on that one. Now Mackie's new CR monitors can be added to the list. We took a look at the CR3s and were impressed from the start. 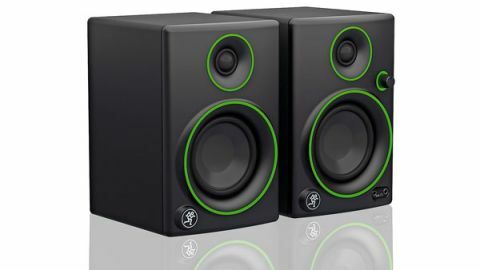 "The sound is detailed but the top-end can get a bit swallowed up by the bass extension"
The 50W powered monitors deliver large sound through the 3-inch polypropylene-coated woofer and .75-inch ferrofluid-cooled silk-dome tweeter, with a frequency crossover of 3kHz. They are arranged in the standard active/passive arrangement for monitors of this size and price bracket, with the added bonus of powered side being switched to either the left or right. The sound is detailed but the top-end can get a bit swallowed up by the bass extension courtesy of the rear-facing ports. There are no attenuation controls to cope with EQing and room placement, but at this price it's a small grumble. Also included are foam isolation pads complete with angled wedges for listening accuracy - not as dense as Auralex MoPads but still effective with such a small, lightweight enclosure.